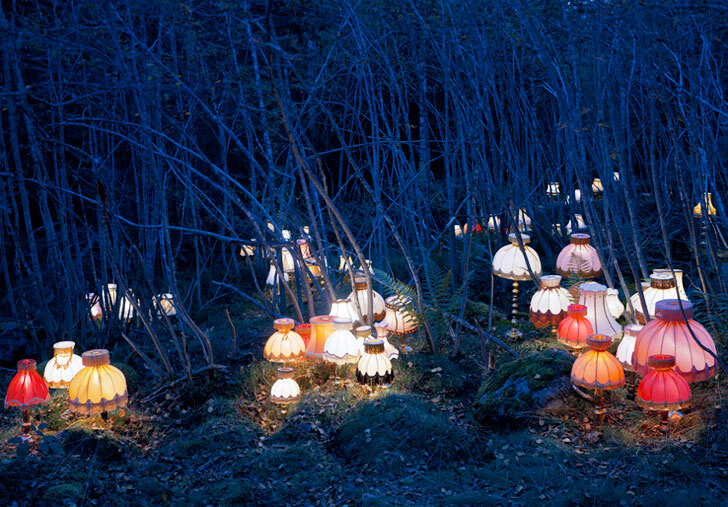 Embed and caption an image and/or a YouTube/Vimeo video of the project (if available). Label your blog post with the Category, LookingOutwards-10 and with your Section Category. In this Assignment, you will use Turtle Graphics to render a series of meanders. The purpose of the assignment is to introduce you to the use of Turtle Graphics. The Assignment also stresses the use of the while() iterative construct. Meander motifs on Greek vases, 1st millennium B.C.E. 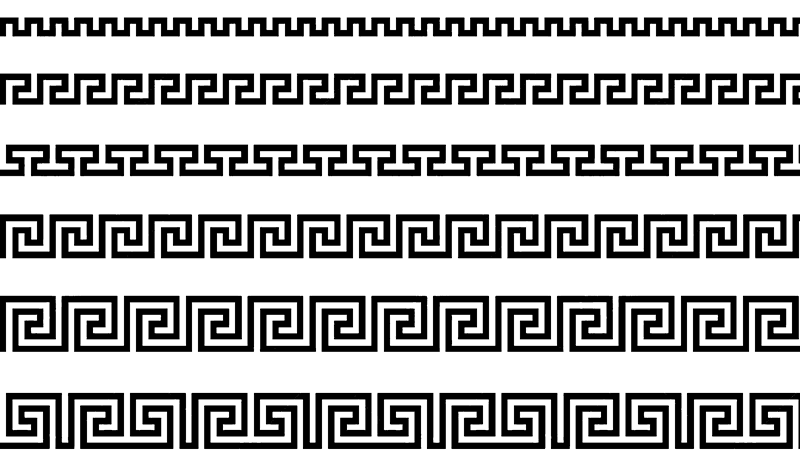 A meander or meandros (Greek: Μαίανδρος), also called a Greek fret or Greek key, is a decorative border constructed from a continuous line, shaped into a repeated motif. Meanders are common decorative elements in Greek and Roman art, used as running ornaments. On one hand, the name “meander” recalls the twisting and turning path of the Maeander River in Asia Minor, and on the other hand, as Karl Kerenyi has pointed out, “the meander is the figure of a labyrinth in linear form” [Wikipedia]. The meander, we are reminded, is like the zig-zagging course traced by someone… someone, perhaps, like our Turtle. Observe the above designs carefully, noting their differences. Trace them out with your finger, making a note of when you turn left, when you turn right, and how far you travel on each leg of the motif. Using our p5.js lightweight sketch template, prepare a canvas whose dimensions are 600 x 400. Using Turtle Graphics, you are asked to render all six meanders into the same canvas. You will render them all in one single instant, using noLoop(). Our p5.js Turtle Graphics code and API can be found here (Turtle Graphics). Using pencil and paper, take a moment to figure out what is the “irreducible unit” that is repeated in each of the above designs. You must use an iterative code structure to direct your Turtle to repeat this unit across the canvas. You will notice the obvious fact that the smaller motifs (for example, in the top row) are repeated more frequently. For full credit, you must use a while() structure to govern the repetition of your turtle. Thus, instead of asking your turtle to (for example) repeat the bottom motif precisely 7 times, you would instead ask it to repeat that motif so long as (i.e., while) the turtle’s horizontal position is less than the width of the canvas. Your turtle(s) should draw a black line against a white background. We strongly recommend you set your strokeWeight to 6 pixels, your strokeJoin to MITER, and your strokeCap to PROJECT. You may choose to execute this Assignment with six different turtles, or with a single one; either way is fine. Put the following information into comments at the top of your code: Your name; Your class section or time; Your email address, including @andrew.cmu.edu; and Assignment-10-A. Name your project folder UserID-10-a. For example, if your Andrew ID is placebo, then your project folder should be placebo-10-a. Zip and upload your code to Autolab, using the provided instructions. Zip a directory (folder) containing this and also Assignment-10-B. In this Assignment, you will use Turtle Graphics to render a phyllotactic (golden) spiral. The purpose of the Assignment is to reinforce your understanding of Turtle Graphics. The Assignment also introduces a key form in computational graphics and biological morphology. 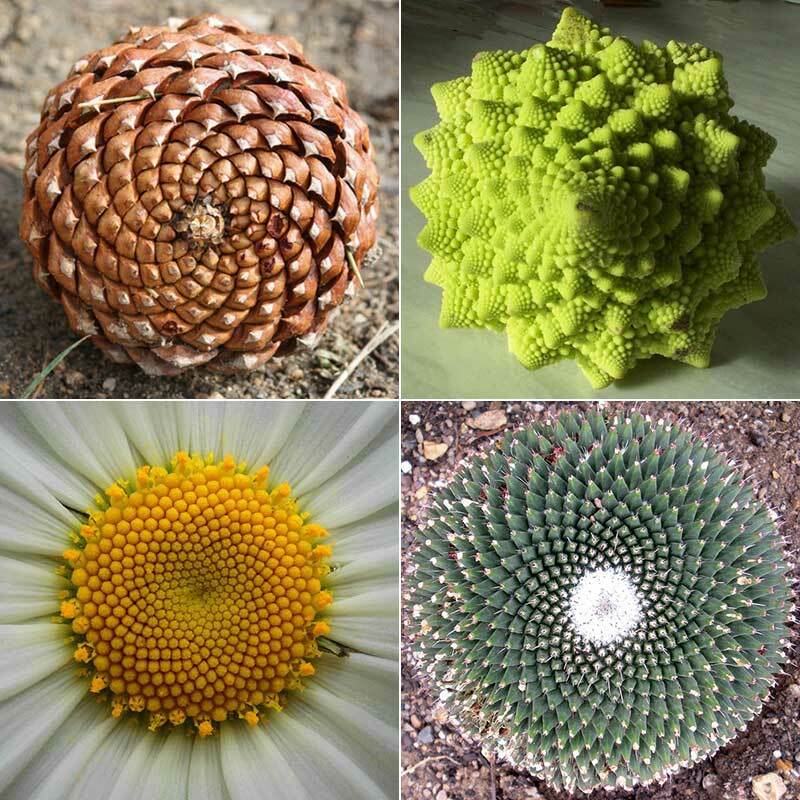 Phyllotaxis is one of the best-known patterns in nature — a core principle of biological growth which governs the morphology of many plants. This beautiful arrangement of leaves in some plants obeys a number of subtle mathematical relationships, which are closely connected to both the Fibonacci number series and to the Golden Ratio. The phyllotactic spiral has been shown to be an optimally-efficient solution for the close-packing of growing elements — such as leaves, petals, and seeds. More information about this important pattern can be found at this excellent site. In a phyllotactic spiral, subsequent elements (such as leaves) are rotated from their previous elements by the Golden Angle. This angle, which is approximately 137.507764°, is obtained from 360°/ϕ², where ϕ (phi) is the Golden Ratio (approximately 1.618034, or precisely [1+√5]/2). In the illustration at left below, the Golden Angle is the angle subtended by the smaller (red) arc when two arcs that make up a circle are in the Golden Ratio. In the lower right, you can see that each (numbered) leaf of the plant is rotated by this angle from the leaf with the previous number. The optimality of this arrangement becomes clear when you consider that more “common” angles (90°, 45°, 30°, etc.) would cause leaves to overlap precisely, blocking the sunlight from leaves lower down…. Using our sketch template, prepare a canvas whose dimensions are 600 x 400. Have your turtle start drawing at the center of the canvas. 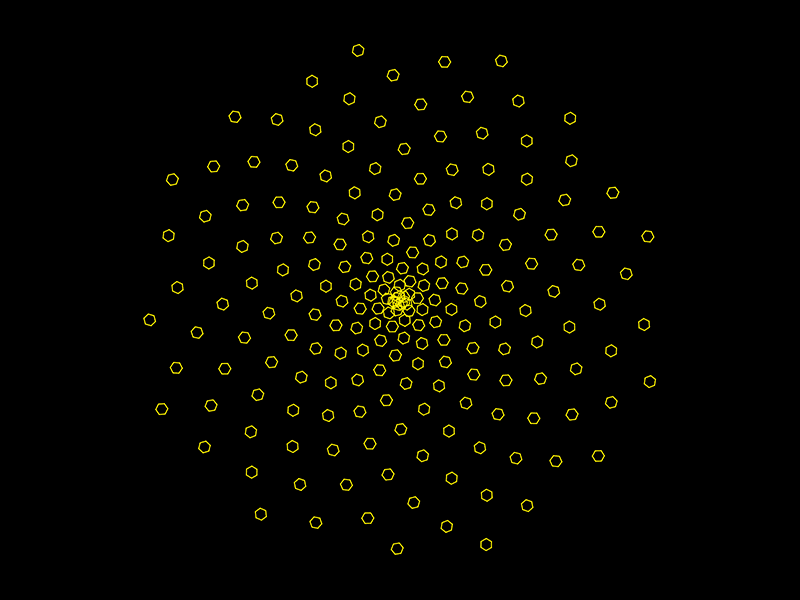 At each step in the spiral, your turtle should draw a small regular polygon, such as the hexagonal “seeds” shown above. Be sure to have your turtle use the Golden Angle, ~137.507764°, to reckon where to place the next seed. Please note, you are prohibited from using p5.js drawing commands (such as ellipse(), rect(), etc.). Put the following information into comments at the top of your code: Your name; Your class section or time; Your email address, including @andrew.cmu.edu; and Assignment-10-B. Name your project folder UserID-10-b. For example, if your Andrew ID is placebo, then your project folder should be placebo-10-b. Zip and upload your code to Autolab, using the provided instructions. Zip a directory (folder) containing this and also Assignment-10-A. Limit your design to a canvas which is no larger than 480 x 480 pixels, please. Label your project’s blog post with the Category Project-10-Landscape and with your Section Category. Incidentally, the sketch below shows what’s “really” going on here, in terms of the way buildings are added (on the right) and removed (on the left). Check out the technique to remove an item from an array (or more precisely, the technique to construct a replacement array with one or more items removed), and the little pattern we use to decide whether or not to add a new building. // Simple demonstration of the noise() function.